Tadhg O’ Mahony is a Senior Researcher at FFRC. He was awarded a Marie Sklodowska Curie postdoctoral fellowship by the European Commission to be conducted at the Finland Futures Research Centre of UTU. This is a H2020 funded research project on the links between material consumption and wellbeing, energy scenarios for Europe to 2050 and policy to maximise wellbeing and minimise emissions ‘MAXWELL’. 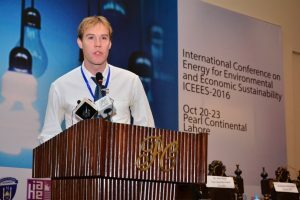 Originally from Ireland, Tadhg worked in environmental management for two years before returning to the Futures Academy of Dublin Institute of Technology to complete a doctorate on energy emission scenarios for Ireland. Following this, Tadhg completed a two-year postdoctoral position at IMDEA energy institute of Madrid before coming to the Tampere office to work alongside Jyrki Luukkanen. Tadhg has lectured in sustainable development and EU policy, cooperated with environmental NGO’s, been involved in a number of consultancy projects for government and industry and has represented Ireland at the UNFCCC. His research is broad and transdisciplinary, from economics and technology to the social, cultural and political, and reflects the variety of domains required by scenarios and future studies. In particular, he is interested in low-carbon transition, sustainable development, mitigation, energy policy, wellbeing and scenario approaches. He is also interested in development indicators, sustainability assessment, decomposition analysis and energy modelling.